SANFL has today released the fixture for the 2018 Macca’s League Finals Series. The fixture will see all Macca’s League finals held at Adelaide Oval on a Sunday, commencing with the Elimination and Qualifying finals double-header on September 2. 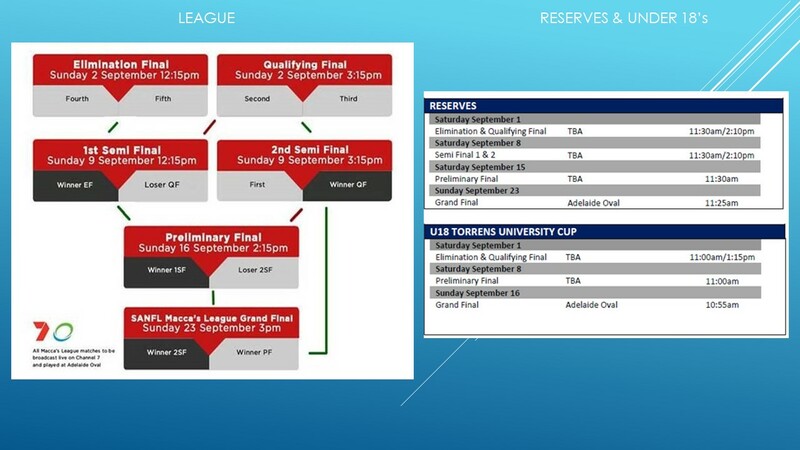 The Grand Final, as previously announced, will be held on Sunday, September 23 at 3pm. Every final will be broadcast live on Channel 7. Games also will be live streamed via SANFL Digital Pass, including the Reserves and Under 18’s Torrens University Cup grand finals.